Yamaha has hit a home run with the new Revstar series which was first introduced in 2016. 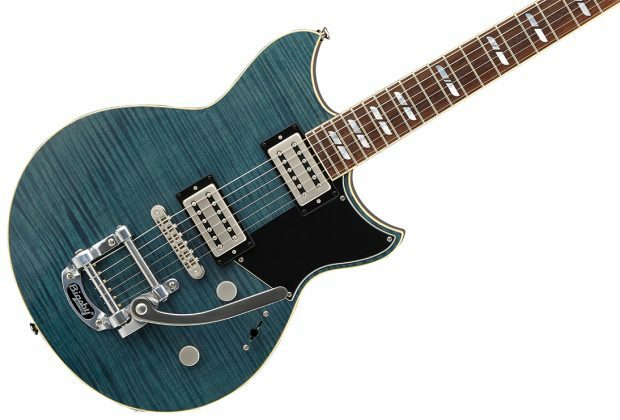 Yamaha has seemingly done the impossible: come up with a new guitar design that both captures vintage vibe and modern style. The Revstar RS720B guitar oozes cool! The Revstar line has been very popular since its release, with a number of different models in price ranges that are accessible to all guitarists. 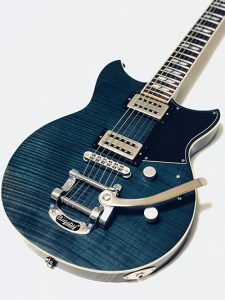 Make no mistake about it, the RS720B is a cool guitar with impressive craftsmanship, and you would be easily fooled into thinking that it would cost 2-3 times what it sells for. Inspired by vintage street-racing motorbikes of 1960s London, Yamaha has seemed to magically blend their illustrious history of racing and musical instruments in a guitar series that is bound to become a classic. With performance that matches the guitar’s hot looks, this is an instrument that really impressed us in every way. The toughest question now is really just whether or not our spouse will allow one more instrument to come into the house! The Yamaha Revstar RS720B is solid-body, double cutaway guitar, made of mahogany with a beautiful hand-brushed, satin finished, flamed, maple laminated top. The binding, which runs along the entire edge of the body, neck and headstock, has an aged, tinted, cream color. The Vintage Japanese Denim finish was as attractive as the top we’ve seen on many pricier boutique instruments. The neck is a set-in, three-piece, mahogany neck with 24.75” scale length. It has a glossy polyurethane finish in a dark brown-black color. The neck is equipped with a standard truss-rod, adjustable at the headstock, and a black urea nut, which is similar in tone to a bone nut. The neck is 1.69 inches wide at the nut and 2.1 inches wide at the twelfth fret. It is 0.83 inches thick at the first fret and 0.99 inches at the twelfth fret. The fretboard is a dark rosewood with 22 jumbo frets and a 13 ¾ radius. The inlays are unique and really add some great style to the guitar. The Revstar is equipped with two new Yamaha Guitar Development designed, low-output, humbucker pickups. They feature alnico-5 magnets, a brass baseplate, and underwound polyurethane wire. The neck pickup specs at 4.3k while the bridge is slightly hotter at 4.9k. 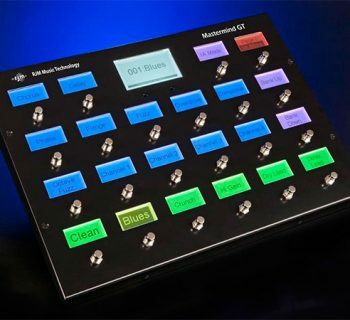 There is a master volume, master tone control, and a three-position lever switch. 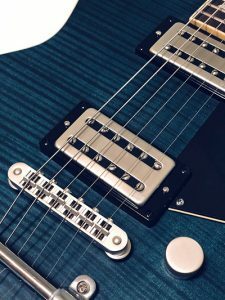 The Revstar also has a newly designed, push-pull Dry switch on the treble control which functions similar to coil splitting humbuckers but without a loss in volume. We will discuss this more in depth in the Sound section. The RS720B is the only Revstar in the series equipped with a Bigsby B50 tailpiece. It has a Tune-O-Matic bridge and three-ply, black pickguard and die-cast locking tuners. All the hardware except the Bigsby is in a brushed satin finish. The guitar comes set-up with Elixir 10-46 Electric Nickel Plated Steel with Nanoweb Coating strings and includes a durable, high-quality gig bag. The Revstar RS720B is manufactured in Indonesia. The Yamaha Revstar RS720B guitar felt fabulous the moment we picked it up. It has one of the most satisfying and inviting necks we have ever played! Although the guitar weighs a little over nine pounds (4.2kg), it was very comfortable and well balanced off the shoulder and exhibited excellent resonance when played unplugged. It did have a slight neck dive but settled in at very neutral position. The intonation was spot-on, and the frets were perfectly dressed. The jumbo frets made bending a breeze. The aged binding ran all along the body, neck and headstock and gave the guitar a nice vintage vibe. The guitar was equipped with locking tuners with a brushed finish that were smooth and easy to tune. The guitar stayed in tune extremely well even with big bends up and down with the Bigsby tremolo. We were able to create some luscious vibrato as well as some impressive dive bombs all the while returning right back to near-perfect tuning. The Revstar’s neck fit like a perfectly tailored Italian leather glove in our hands—not too thick and not too thin. The neck has a 13 ¾ radius and was very inviting from rocking bar chords to fiery soloing on the upper frets. The Revstar’s body features a deep belly cut, hidden forearm contour, and a very comfortable and smooth contoured neck heel for outstanding upper fret access. This made upper fretwork painless and seamless. The combination of the mahogany body and low-output pickups made for some outstanding vintage tones. The push-pull Dry switch added versatility without some of the pitfalls that occur with coil splitting. 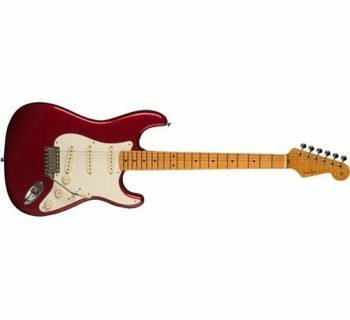 The Dry switch was designed by Yamaha specifically for the Revstar series and incorporates a push-pull switch with a passive filter to create single-coil like tones. Engaging the switch did reduce some of the bottom end with almost no drop in volume while adding ever-so-slightly increased clarity. Not glassy like a Strat single coil tone, but more definition and clarity than a P90. Also, there was none of that single-coil hum that can occur with some coil-split humbuckers. Think of the Dry switch as more of an onboard EQ with no battery required. The new, low-output humbuckers were clear and punchy but never muddy. The Revstar RS720B has the lowest output pick-ups of all the guitars in the series. Given that this model also features a Bigsby tremolo, you can tell that the design is targeting vintage blues and early rock n’ roll more than any high-gain hijinks. One of the most impressive things when playing this guitar was the full range of use of the volume and tone knobs. Many guitars get muddy when rolling off the volume and tone controls. The first thing we noticed when rolling off the volume control was that we were able to get an almost vocal-like quality tone that wasn’t muddy, all the way down to low volumes. Also, rolling off the tone knob completely gave us really creamy vocal like tones without any muddiness. In addition, the tone and volume controls were usable through their entire sweep from 0-10. These are really uniquely voiced pick-ups that stand in a category all their own. Great for vintage vibe, but not the right choice if you’re looking to playing metal or shred (other Revstar models have hotter humbuckers if that’s your goal). We wanted to see if the guitar could meet our needs playing different styles such as punk and harder rock. We tested it next on the clean channel of a Blackstar HT 20 equipped with a Weber Blue Dog speaker. The clean channel falls into the “pedal platform” category of amps. We first got superb rock/blues tones with an Ibanez Tube Screamer TS7 set to Regular mode that were never muddy. Then we switched it to Hot mode and were able to really crank it up. We ran through some rocking cover songs like Green Day’s “Basket Case” and Weezer’s “Hash Pipe.” Although these are low-output humbuckers, we had no problems getting harder rock sounds and cutting through the mix. However, generally speaking, this guitar really sounds best with vintage, bluesy, overdriven tones rather than high gain tones, and it also sounds great with a fuzz pedal. 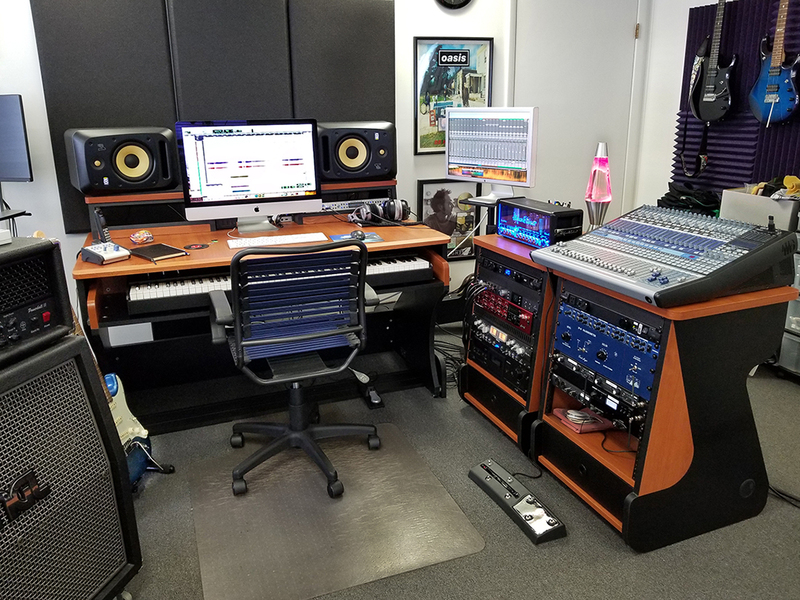 Recording with the guitar was a breeze and we were really able to appreciate the circuitry and vocal quality tone with adjustments in the volume and treble knobs. Finally, it was time to take it for a spin at a gig. We used it with the Blackstar amp, mostly on the clean channel with our pedal board to cover the diversity of songs in our set. To be honest, we just felt cool playing this thing on stage. After adjusting our stage volume, it was time to let loose. With three different pickup settings and the dry switch, there were six very usable options. Our sound person kept asking us to turn it up, which was music to any guitarist’s ears. With songs ranging from Gary Clark’s “Bright Lights” and 7Horse’s “Meth Lab Zoso Sticker” to Pearl Jam’s “Alive” and Tom Petty’s “Running Down a Dream,” this guitar shined in every way. Playing a few originals ranging from a rock/fuzz style to a funky rhythm part was no trouble at all and the Revstar was able to adapt and fit-in nicely. It should be noted that there are slight overtones that ring out from the Bigsby tailpiece. They are not noticeable when amplified or in a mix, but are slightly noticeable when playing the guitar acoustically or alone with an amp. There is a general guitar manual in multiple languages included, which is also accessible on the Yamaha website. 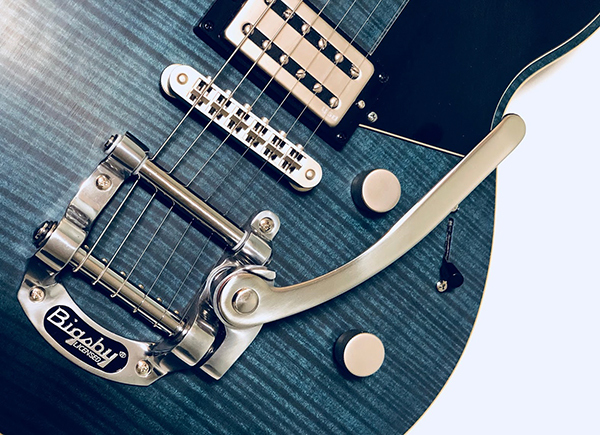 The manual does not have any specifics regarding the locking tuners nor the Bigbsy tailpiece, but you can learn about Bigsby maintainance and adjustment on the Bigsby website here. The Yamaha Revstar RS720B in Vintage Japanese Denim color (MSRP $1,400) sells for $899.99 street with a deluxe gig bag. This is a fantastic price for a guitar of this quality, easily comparable to guitars costing twice as much. 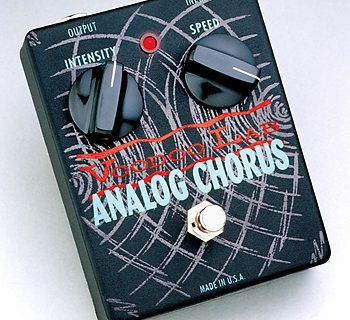 Voodoo Lab Analog Chorus - The BOSS CE-1 Reincarnate?